Oh, Canada. One of the four largest nations in the world (depending on what list you read, it is either second behind Russia, third behind Canada, or fourth behind the United States. We don’t want to cause a ruckus, so we’ll just call it top four. ), despite a relatively small population with 82% of their 35 (or so) million people living close to the border with their southern neighbor along the longest bi-national border in the world. Canada’s history is far too rich and nuanced to get into here, especially when today’s blog isn’t about the country, per se, but rather about their flag. No, not the famous red-and-white flag dominated by a large maple leaf, but rather the flag they used while closely governed by Great Britain. 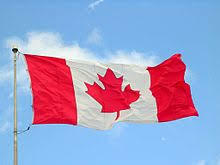 Claimed by John Cabot for England in 1497, the first English colony in North America was in what is now Canada in 1583. Loyalist refugees from the American Revolution went to Canada as exiles, and … well, jump ahead a bunch of years and Canada partially broke from Great Britain in 1867 when they created an independent Confederation government. That’s about the time when they presented their first formal flag, with the Union Jack (the British flag) in the top left canton, a sea of red, and on the red the seal of Canada. Identified as the Canadian Red Ensign, the flag we have on display shows off the emblems of the four original provinces of Canada: Quebec, Ontario, New Brunswick and Nova Scotia. They adopted the current flag in 1964, which means few people remember the glory of this one!